This recording does something other Christmas recordings have not attempted. 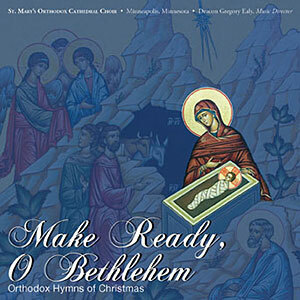 It presents Orthodox hymnography from the liturgical year that foreshadows and prepares the Church for the incarnation of Christ. Quite possibly, what is most interesting about this disc is that, in most cases, this is the first time many of the pre-festal hymns have been recorded in English according their special melody. In a very real way, this recording takes the listener on a liturgical journey from the Annunciation to Christmas by way of the Church’s hymnography. In 1891 Professor Paul Zaichenko enlisted eight members of St. Mary’s Church to form an octet to sing at divine services. These immigrant men from the Carpatho-Rusyn region of Eastern Europe had no previous musical training, but their desire to sing has served as the foundation for decades of beautiful music glorifying God through hymns and songs of praise. 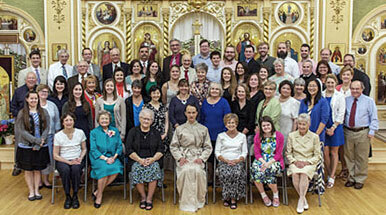 Since those early immigrant days in Northeast Minneapolis, the Cathedral Choir has become a fixture and worthy example of Orthodox liturgical music in the Upper Midwest and beyond. Deacon Gregory Ealy is a graduate of St. Vladimir’s Orthodox Theological Seminary, Yonkers, NY, where he received Master of Divinity and Master of Arts degrees. He is responsible for leading the choir at services and weekly rehearsals, providing music education to the choir and parishioners, preparing music for the services, and working with the parish’s junior choir. Deacon Gregory has been the cathedral’s music director since 2011 and is the twenty-seventh director since its founding in 1891.